For courses in Developmental English with students of varying skill levels, or those in need of additional writing practice prior to college-level writing. A highly visual, theme-based approach to writing that meets you where you are, and guides you to where you need to be. 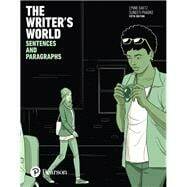 The Writer’s World series integrates essential elements that are simply not found in other writing books – a stimulating visual program, thoughtful coverage for nonnative speakers, and effective strategies that address the skill levels of all readers. Authors Lynne Gaetz and Suneeti Phadke draw upon their more than 30 years of combined teaching experience to reach as many readers as possible, by meeting their needs and addressing their individual interests and abilities. The authors’ innovative instruction seamlessly infuses material for both native and nonnative speakers, while their exercises and activities encourage active participation and collaboration. The engaging design, open layout, and dynamic images support visual learners and prompt critical thinking. Available to package with The Writer’s World: Sentences and Paragraphs, 5th Edition (Books a la Carte loose-leaf edition), MyLab™ Writing is an online homework, tutorial, and assessment program designed to work in tandem with the text to engage students and improve results. MyLab Writing is ideal for courses requiring additional writing skills practice and assessment. Lynne Gaetz, a professor of English language and literature, has been teaching at the college level for over 20 years. She obtained a masters degree in English literature, as well as a TESL diploma and a college teaching diploma. In addition to the series, The Writer’s World, she has written over 30 successful English second language textbooks for college-level students. Her most recent series, containing a separate skills and grammar component, is Avenues. In her spare time, she loves creating art; her preference is mixed media and oil painting. She is also an avid traveler, who intends to visit every continent. Suneeti Phadke has a graduate degree in Russian language and literature, as well as a bachelor of education degree in teaching English as a second language. She has been teaching English language and literature to college students for more than 20 years. She started her writing career around the same time as her teaching career. Her first writing project was to develop correspondence courses for college-level English for the Quebec Ministry of Education. This experience led her to writing academic textbooks for Pearson. Currently, she is also trying her hand at other types of writing, such as short stories and poetry.